I only teach about 10 to 12 hours per week and several years ago I worked part-time as an aide for a kindergarten teacher in public school. I know what it takes to prepare for class. For instance, today I washed 24 yoga mats, cleaned 12 eye pillows and by tomorrow will wash 20 blankets, by Monday will have made at least a dozen copies of my meditation cd. No, I do not get paid for all of the above.....but if you know any teachers, they don't get paid for all they do either.....no matter if they teach math, art, whatever. You do the extras because you want to be a great teacher, you do the extras because you care about your students. Today is the first day since treatment on Wednesday that I have not had meningitis, hopefully the worst is over for this time. brightness. I also got a Farmer's Almanac weather update on Wednesday.......these guys say no matter what the ground hog sees or doesn't see, there will be six more weeks of winter, maybe longer. Interesting to see how these predictions pan out. Super Bowl Sunday is tomorrow.....confession.....I didn't know until yesterday who was playing.....I never watch anything but the half-time show ( if it is someone I like). Hopefully I will be watching a great movie tomorrow night or reading.....we watched Saving Mr. Banks tonight, it was wonderful. Can you believe today is the last day of January, 2015? If by chance, any of you ever experience aseptic meningitis here's the drill........ice pack for the back of the head, ibuprofen for pain, nausea meds, turn off the lights or wear dark glasses, lie down, lots of fluids. That was my night last night, and for a while tonight......interesting stuff......but then this blog is transformation information, and I try to share helpful tidbits. I hope none of you ever have the need for this particular info. Rick is making me a cup of hot tea, and the light from this computer screen is getting brighter by the minute. I hope your weekend brings rest, fun and always......peace and joy. Couch day, around three this afternoon I finally dressed and took the dogs for a walk. The early stages of meningitis are knocking on my door tonight.......the good news, Rick is home. It was almost 70 degrees here today, I can promise you, we will pay dearly for this one. I hope your Friday opens the door to a grand and glorious weekend. I hope you all get leave work early tomorrow and there is sunshine to light your way home. Treatment #38.......the first one that Rick has not been with me.......he's in California with the new job. My niece Samantha took me to treatment today.......she and Jordan are spending the night tonight. They cooked dinner for me, and since tomorrow is Jordan's birthday.......they baked a blue cake. Nothing like blue birthday cake with yellow frosting......we're talking Smurf blue and Happy Face yellow. The treatment room was quiet today, my friend Louis is doing much better so he didn't make an appearance today........things were just not the same without Louis and Rick. One of my nurses, Justin is getting married in a couple of weeks so we spent a great deal of time talking about the wedding.......he is so excited......he will be a great husband. Ordinary is good on treatment day and that thank goodness that is how today has been. Just typical fever and headache and fatigue. It will be an early bedtime tonight, Sam and Jordan have gone to bed, I can hear them reading to each other.......I wish they would spend the night more often. It is hump day, so I hope that if there has been any bumps in your road, they were small. really wonderful classes today, these times remind me of why I love teaching yoga so very much. An empty house tonight......Rick is out of town......very quiet, even the dogs are quiet. Today is the 24th anniversary of my dad's death.......I miss him. A beautiful Sunday morning, clear blue skies, then the clouds moved in, then the rain.......a valuable lesson......enjoy those blue skies, they might look as though they are here to stay.......but, you never know. This is treatment week and it will be the first time in three years that Rick won't be going with me......his new job is taking him to California this week. Glad for him, sad for me. My sister Pat is going with me and Sam and Jordan will spend the night with me on Wednesday.......all good company......but I will miss the Rickster. This is the last week of January........already, time is slipping by......the first month of 2015 almost gone. I hope this last week of the month is a good one for all of you.......remember it will be spring in the blink of an eye. Happy Birthday Jordan! 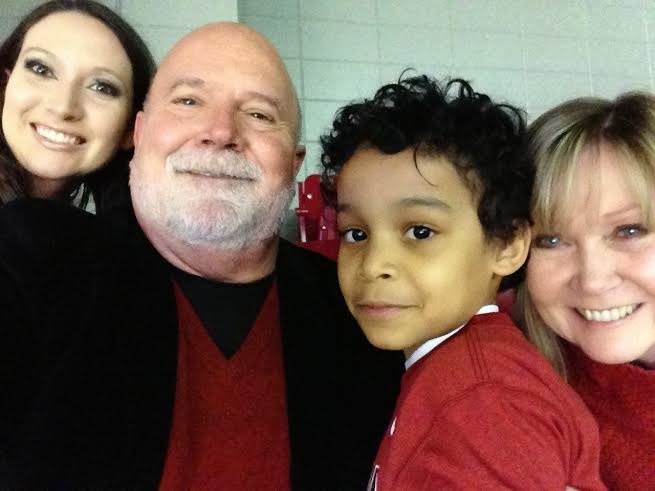 For his birthday party, he asked his mom to have it at the Alabama/Auburn basketball game tonight. Like his mom, he loves round ball. So, Jordan celebrated his birthday and Bama's win with about 15,000 fans........it was a fun time. Samantha, Rick, Jordan and me of course, in our selfie with our game faces on. Roll Tide! Last Friday, at the beach, blue skies, sunshine, temps in the 60's. Hope your weekend is full of good times......and just remember, change is always around the corner. A lesson in mindfulness today........we pride ourselves in multi-tasking, but honestly our pride should come from our ability to focus on one thing at a time. How many times do we drive with no awareness of our trip, we eat with no awareness of the food in our mouths, we talk with friends and run lists through our brains about what we are going to do tomorrow. The next time you wash dishes, or sweep your floors or fold laundry......be aware of each movement, aware of the dish, the sensation of the water, the temperature of the water........notice the bristles of the broom, the movement of the sweep, the texture of the floor......feel the clothing as you fold, notice the softness, the colors, the fresh clean smell. Mindfulness is calming, soothing, tension releasing.....a way to increase awareness in our lives as well as those around us. If you commute to work tomorrow, take notice.......do you pass by houses, a school, trees, water? When you talk with someone......take the time to give them your attention, all of it, not just part of it. If you do a mundane task.....notice each step, take pride in doing it well, let it relax your mind. Spend a few short minutes a day practicing mindfulness......you will see a difference in your stress levels. 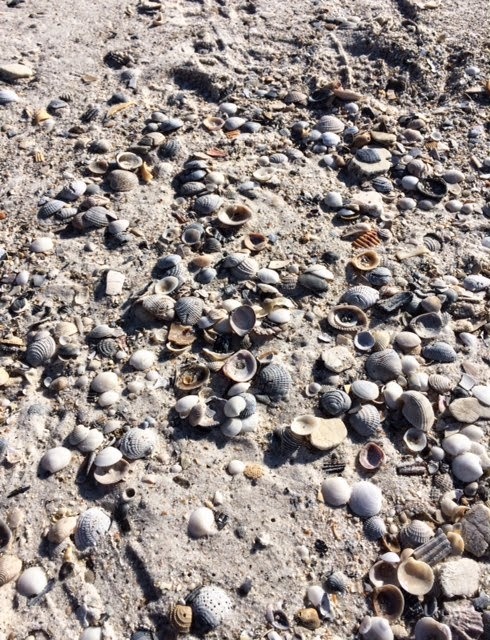 While we were at the beach this weekend, I did as I always do, picked up sea shells........as I bent down to pick one up in particular, Rick laughed and said this is your blog. I wasn't sure what he meant, but he looked at me and said, that shell is broken, you do that you know, you gravitate to the broken. Then I understood.........yes, my blog is Transformation Information, yes I am a yoga therapist at an addiction center, yes, I am the one my friends call when they need to talk, ........it's ok. There is beauty and perfection in the broken......actually we are all broken in some way. Broken hearts, broken spirits.......some are just way more broken than others.......some manage to mend and go ahead with their lives, some don't or can't. I think our breaks, our cracks, our scars do create beauty.......that is the beauty that shines in our eyes, that permeates from our very existence,that creates the love and kindness toward our fellow human beings. I know, some of us allow the breaks to harden, to callous us......sometimes we think no one else has suffered like we have or that we don't deserve our breaks and cracks. But, in the end, no one is smooth and perfect, each of us has been broken by life at some point, scarred by heartache and misery. If we could only realize that is life's way of creating beauty within us, that our incredible being of light shines even brighter because of the scars and jagged edges . So it becomes important that we release our obsession with perfection, our misguided perceptions of it, and see that broken is really life's perfection.......broken is the formation of who we become, of who we are and who we will be. It didn't feel much like winter today. The sign at the local bank which alternates between time and temperature showed at 2:40 yesterday afternoon, it was 70 degrees. It would be easy to think spring is just around the corner, but time has taught us to be patient this time of year because we haven't seen the last of old many winter. 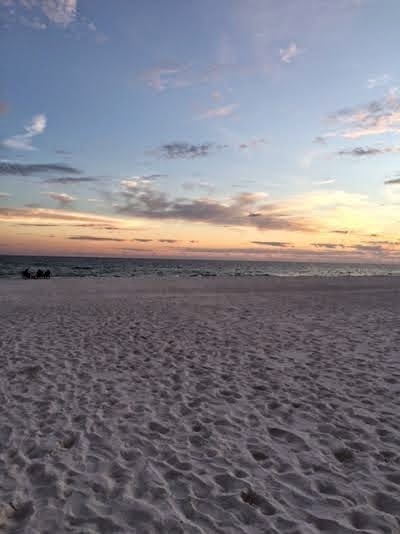 Rick and I did our annual "Happy Birthday Rick" trip to Orange Beach this weekend. It was in the 60's with lots of sunshine. We walked on the beach, ate great seafood and visited one of our most favorite towns, Fair Hope. Even with clouds, the sunsets were amazing....... I love the beaches this time of year, not many visitors and the skies are at their most beautiful. Though it was only a couple of days, we both needed the change of pace and scene. I heard a DJ on the radio talk about the latest stats on Americans and our vacation patterns.......seems all of us are taking fewer and fewer vacations, even short getaways. That is sad, we all need a break from the daily grind.....even if it is a staycation. A change of pace and scene from our daily lives is good for the spirit and soul. Even a day spent outdoors is healing. If money is an issue, take your vacation time a day here and there......spend the day at a state park, on the banks of a river.......anywhere with Mother Nature......she is a great balm for what ails you, physically and spiritually. It has been a laid back Saturday.......we decided to go out for lunch today, after we parked in the parking lot, I walked over to fountain where some kids were playing. I realized that for the first time in several days the sun was shinning and I looked up at the sky. 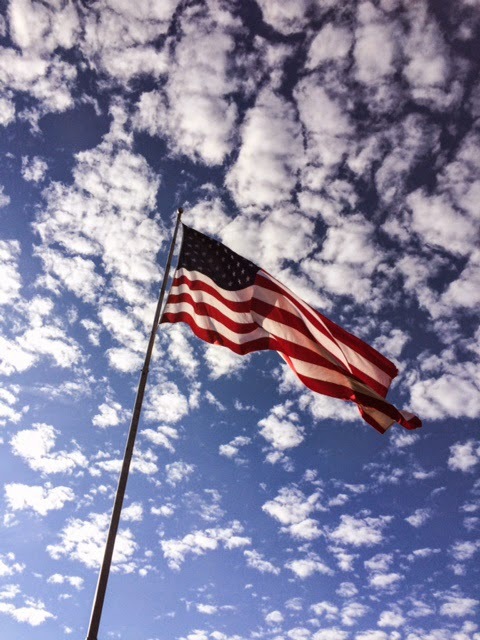 Much to my surprise I saw the flag flying against those clouds, I was taken aback. The flag was so big, I don't know how I missed seeing it as I got out of the car, but when I looked up........what a sight to behold. Life is often like that.......we're so focused on one thing ( I was seeing the kids/fountain) that we miss the big picture. Looking up gave me a view of an exquisite sky and Old Glory waving proudly.......so by changing my view for a split second........I saw something totally different. It pays to be perceptive of our surroundings, to see from a different angle.......sometimes we just need to look up. One of our best friends, Charlie Brown ( yes, that is his name) sent us a book yesterday......Steal Like An Artist by Austin Kleon. Pretty interesting stuff about unlocking your creativity. It is a fun read, quick and informative. If you are like Rick and me and sometimes suffer from the dreaded creative block, read this book. I think it will probably be one of those books that I buy and pass out to friends. The weekend is upon us, hope you have plans for something fun, that you laugh at yourself and smile at a stranger. The American Chiropractic Association reports that at any given time, 31 million Americans suffer with lower back pain.......wow.....so with that thought in the back of my head, classes were all about the back today.....slow, easy cow/cat postures ( seated, kneeling and standing) gentle twists, knees to chest, side stretches and boat asanas to strengthen the core. Everyone in both classes admitted to back pain, all left class smiling. Yoga has been proven to help with lower back pain. It is still cold and damp, snow flurries, sleet and rain were on the agenda today......I actually saw snowflakes falling as big as nickles.......I did my snow happy dance. But with cold damp weather, back issues can flare......get thee to a yoga class, talk to the instructor, take it slow and easy and feel better soon. At 64 years young, his back issues are almost non-existent since he started his yoga practice......and he can touch his toes! with much gratitude, thank you all for your love, healing energy and prayers......I am better tonight. I have learned the hard way, when the lungs act up, it's time to act fast, not think or hope it will go away or get better. Called the pulmonary doc, got the meds started yesterday......all I can say, bless the one who created antibiotics, without them....well, we know the drill. Couch time, large quantities of hot tea, a short walk with Rick and the dogs and hot and sour soup.....that has been my day. But, in the meantime.......life continues to amaze me, friends call, send notes, family checks in. It is good to feel the love. Even Taz takes care of me on the bad days. It is still cold and damp here in Alabama........but I actually enjoy it in a weird sort of way. I love the fact that Mother Nature demands rest for living things, it is nice to know that as the trees and plants here lie dormant, their energy is building for growth and flourishing come spring. 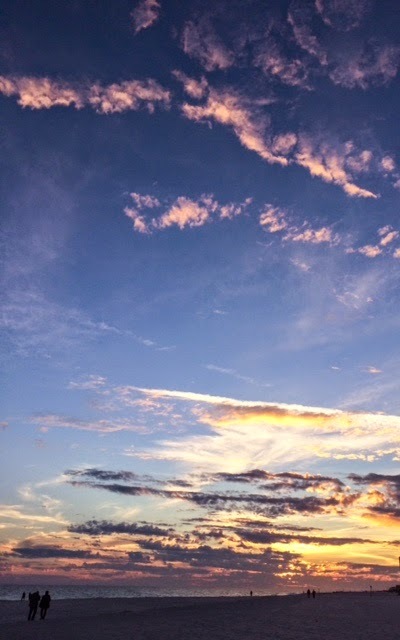 The sunsets and evening skies grow more beautiful with the cold and the stars sparkle and shine. Some mornings the frost is so thick and heavy that the fields and bare trees shimmer in the early light of day. There is beauty even in the starkness. I always hope for snow, even just a few flurries make my day. Some curse winter and wish away their time waiting for spring......it's important to find beauty every day, to be in the present, the future will come as it should. Another cup of hot tea awaits me, wishing you all a warm cozy night, a loving hug and a sweet smile. For the past few days I have fought some sort of gunk that is going around......fever, cough, chills.....I think it is winning. Even my beloved hot Epsom salt soak has not improved my condition much today. I think tomorrow may be a sofa, hot ginger tea kind of day. I taught my classes today, crackly voice and all......and yes I will rest my voice and my body tomorrow. A cup of hot lavender honey tea beckons to me as I write this blog.......my brain is retiring in a feverish funk. On this cold foggy Monday night, I wish you all peace. It seems that every magazine I pick up these days has an article on meditation......it is the next "big thing". Ha,ha......brings a smile to my face, I have been teaching meditation classes for years, practicing for years.......generations have practiced meditation for a few thousand years. But I am thrilled that we are finally "getting it". That the masses are understanding that calming the mind, learning to observe and not struggle has incredible benefits. Awareness of your breath is life changing and now thanks to the media, and the rich and famous......everyone can learn the value of something so simple. The simplest way to meditate......just sit and breathe, when your thoughts rush through your brain, it's ok, notice your breath, observe your thoughts remember it's practice, like yoga or playing the piano or riding a bike.......practice......set a timer for five minutes, then get comfortable, close your eyes and breathe, notice your breath, don't judge you thoughts, an itch, a pain......just notice your breath. After dinner tonight, we watched an old movie, Wonder Boys......Michael Douglas, Tobey Maguire and Robert Downey,Jr. I love it.......it has been one of my faves since the first time I saw it. The screen play is funny and smart, and the "Wonder Boys" are at their best. I won't give the story away, but it is about a college professor, his student, and a book editor and a strange and wonderful weekend. Not sure who the music editor was for this film, but they did a great job with the music. It has been a laid back Saturday, Rick has recovered nicely from his root canal.......we walked the dogs this afternoon and the spring was back in his step. It was almost sunset when we walked, the bare trees and fallen leaves were beautiful in the evening glow. Clouds have started to move in, rain is on its way.......Calliou and Taz ran and sniffed, ran and sniffed......it's a dance they do, this run and sniff thing. The air was cold, yet if felt so good to be outside, to move and breathe. I love how alive you feel walking in the brisk air of winter. Tomorrow our songwriter's group will meet here at the house. There is never a dull moment when any of them are around. A pot of chili will simmer on the stove and I am sure the house will be filled with music and lots of laughter. A great way to end and start a week. Wishing you all a restful night, a peace filled Sunday........don't forget to laugh. Many years ago when I first began to teach yoga, I would make class notes and never veer from them.........most often these days, even though I make class notes, they are often pushed aside. I have learned to listen to the students as they walk through the door, and then teach or at least try to teach what they need for that day. I am a much better teacher for trusting my instincts. Often I find that I think I am teaching what the students needs and it turns out to be what I needed too. That was the case today......for my second class I taught a heart opening class.......turns out I needed the heart opening as much as everyone else did. I am as guilty as anyone when it comes to compassion for myself........I have loads of it for others and some days none for me. I found a little for myself in class today. It is Friday, closure for what has been a good, trying, stressful, sad, happy week......to top it off, Rick had a root canal today......and the forty degree temps the weather guys promised for tomorrow.......Ha! they were only teasing........lows back in the teens tonight, highs in the mid-thirties tomorrow and rain Sunday. Wow, am I glad I now have a car with heated seats. Wishing you all a weekend that is grand in every way......a fun filled Saturday, a peaceful Sunday......and many hugs in between. Change.......even good change can be hard. Monday was a day of change .......I got up Monday morning, opened the door to the fridge and realized there were puddles......never a good sign. The fridge had died, Ingrid ( my car) was getting older (19 years) and sicker, our great nephew and niece are moving to London.......I called in to work, took the day off. I found a local mom and pop appliance store who had a fridge, who delivered it that afternoon.......the kicker......neither Rick nor I measured the space......new fridge is about half an inch too big.....my nephew Haven to the rescue......he has a mighty saw, and knew how to use it. My kitchen cabinet is now a wee bit smaller. and since the high temp today was 26 degrees the heated seats that she has made me fall in love. Now I just have to find Ingrid a good home. a new fridge and family to visit in London this year. Wow, January started with a bang. Saying goodbye to someone you love and care for is never easy.........and in the past attending a memorial service never bothered me......but in the past couple of years it has become very difficult for me to attend funerals. A dear sweet friend of my family passed away this weekend......her service was today. This woman had been a childhood friend of my dad's, her parents had been friends with his parents.......and I loved her with all my heart......and I just could not make myself go to the service. The last time I saw her, which was back in late summer.......I knew in my heart I would not see her again. I grieved then and now. I think her connection to my dad ( and this month is the anniversary of his death) was just to much too bear. But I will always remember her kindness, her love and her goodness......and I will remember her laughter. I like to think that somewhere tonight, she and her husband, my mom and dad, my grandparents and her parents are having a great big celebration and their laughter is ringing through out the stars. Goodbye Susie, I will always remember you and love you. Lots of new students today.......it is always such an honor to someone's first yoga teacher. I did not make it to work yesterday, finally NOT sickness, but the fridge died sometime Sunday.......whew, what a mess. It took me all day to clean out fridge and freezer and then we had to go buy a new one. Not only did we buy a new fridge yesterday but we also bought another car..........yep, after all these years I will be saying goodbye to Ingrid.......I will miss her. Today as I was telling my boss about my day yesterday, she laughed and said that was great, as I looked at her strangely, she laughed again and told me, she knew I would not be retiring anytime soon. Back to classes, with all the new faces today and most had never taken a yoga class before......we spent a great deal of time on breathing and then we did very gentle moon salutations ( in honor of that beautiful moon last night). After both classes, all were smiling and asking when I would be back.......that always makes a teacher feel great. I hope your day as been a good one, enjoy your hump day tomorrow. Beautiful full moon tonight, surrounded by a circle of haze......all that a full moon should be. I hope its light shines down on you all tonight and brings you the sweetest of dreams. Lunch with my friends Jackie and Tim today. Jackie and I have met for Mexican food and exchanged Christmas gifts for years. She got me the most beautiful Tibetan healing bracelet.......I immediately put it on my wrist. The food was good, but it did my heart and spirit so much good to get out and see friends. For some reason, all morning I had been teary, just an emotional mess......probably the residue of IVIG, the meningitis, and the aftermath of the holidays.......who knows. But time with friends and the many laughs we shared chased the blues away. After lunch, Jordan and his mom came over and helped Rick take down the Christmas tree........I miss the lights and decorations, but it is nice to have the house back to normal. After the rain and storms last night ( 4 inches of rain) today has been rather chilly.......and the weather guys say the polar express is on its way......single digit lows by Thursday and maybe some snow. Did not have the energy for the vision boards, but Rick got the materials and sometime this week they will be made. Gone are the days when I can do everything in one day. ;) I hope your weekend has been as good as mine. Wishing you a Monday that goes smoothly, something or someone to keep you warm and cozy, time with friends, and at least one big laugh out loud moment. I have given serious thought to my vision board for this year. I always put a great deal of thought into it, but this year, only the big "rocks" the truly important stuff is going on the board. Actually, I have been thinking of doing small individual boards for health, music, friends and family, yoga and travel. I have done more research on vision boards and many of the experts suggest that the most powerful ones are those that are very specific to each topic. It is very important for those of you who do boards, that you look at them every day. You see, once you take the time to place those pictures and words on your board, you start a process in the brain......through your actions you have told your brain that what this board represents is extremely important to you. By looking at the board every day, you remind your brain of the life you want.....if you don't take the steps to achieve that life, then there is conflict in the brain. Vision boards are a very powerful tool, they help you to focus on what is important, to keep things in perspective, to do what needs to be done to change your life. You can do one for your career, your personal life, your creative needs, travel, the change of habits, health, relationships. Just think about and be sure of what you want and then look at yours every day. You will be surprised at what you accomplish. As soon as mine is completed, as always, I will post pictures. I challenge you to do a small one this year.......all it takes are some pictures, words or phrases, a piece of poster board, some glue. Try it.....it will be interesting to hear about your success in the next few months. Meningitis hit fast this time, started yesterday but I felt well enough to teach my classes today, ( wrong) well, I taught all the way until half way of last relaxation........then my friend decided to show her ugly face again. Yep, Rick had to come and pick me up at work.....it is official.....he is my personal taxi driver. I have started the New Year with a bang. All I can do these days is laugh about it. I have cried and berated myself and this illness to no avail. Laughter is good medicine. I have learned much these past three years......what I have learned most.....patience and laughing at myself. I know from personal experience, tears are not the answer on this path.......sofa time, hydration, ice packs and meds get me through......and the laughter. For this first weekend of the new year.......I have hopes of taking down my tree, putting up the decorations and doing my vision board.......we'll just have to see what tomorrow brings......I plan on laughing alot.....I hope you do too.